Paul White believes Kettering Town received a timely “kick up the bum” at Biggleswade Town last weekend. 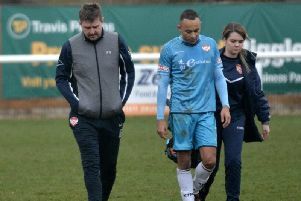 The Poppies went into the clash with the play-off contenders holding an 11-point advantage at the top of the Evo-Stik League South Premier Division Central. But Biggleswade secured a 1-0 success to become the first team to complete a league double over Marcus Law’s side this season. 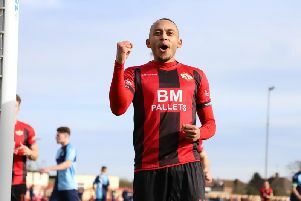 With second-placed Stourbridge beating Redditch United 4-1, the gap was reduced to eight points with seven games to go. Kettering remain in a position of power as they head into a clash with relegation-threatened St Neots Town at Latimer Park this weekend. But goalkeeper White, who has enjoyed an impressive season between the sticks so far, knows he and his team-mates must get back on course at the first attempt. “If you had given us this position at the start of the season or even before Christmas when we were chasing Stourbridge then, of course, we would have taken it,” the Poppies stopper said. “Being eight points clear with seven games to go is a great position to be in but you still have to do the business and do things right. “I don’t think we were quite at it as a team at Biggleswade last weekend. “But every time we have lost a game in the league this season, we have found a way to respond positively and we have to do it again tomorrow (Saturday). “The cliche of taking each game as it comes is a boring one and it’s hard not to focus on the end goal. “But last Saturday was probably the kick up the bum for us. “There’s still a lot of football to be played and there will be twists and turns for us and Stourbridge. “We won’t be overreacting after the defeat at Biggleswade but it’s important we just focus on bouncing back in the next game and put it right. White is coming towards the end of his third season at Kettering and was a key figure in the last campaign, which ended in a play-off semi-final defeat at Slough Town, who went on to be promoted. The Irishman admitted that loss “lit a fire” in the Poppies squad and it has led to them enjoying an outstanding season so far as they bid to ensure the play-offs aren’t needed this time around. And White insists there is a burning desire within the team to deliver the title for their manager. “I think back to that defeat at Slough and it was a horrendous feeling,” White added. “I remember just thinking about what might have been over the whole season as well as in that game itself. But I think it also lit a fire in everyone for this season. “This is my third season here. The first one was disappointing, last year we had the play-off defeat and this season we have really had a go at it and now we need to get over the line. “To be honest, it would just be good to do it for the gaffer (Law) because he puts so much time and effort into his job. “He has taken a lot of criticism but he has taken it on the chin and got on with it. “I think we all want to put in the performances and go and finish the job for him more than anything."